My name is Christiane Stapf and I am from Tirol but living in Vienna. I am a teacher and I love Portugal. From beginning I spent my holidays always in Sintra. It is our second home. The nice and charming penthouse has such a beautiful view out of the living and dining room. and even if there are many turists in Sintra you are up there in a good and quired place. 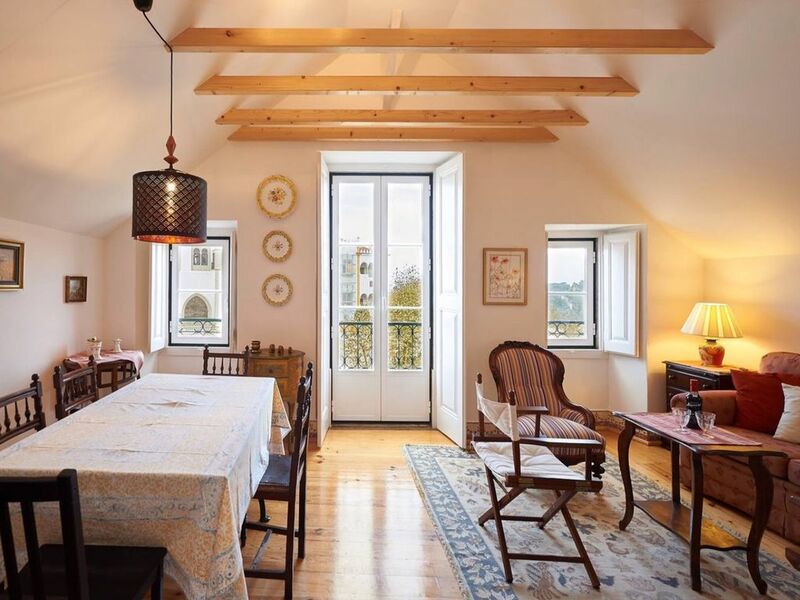 The penthouse is siutated in the historical center of Sintra and so you can visit all the nice places, castles and museums there by foot. also a trip to Lisbon is easy from there without car. But if you want to visit places like Tomar, Batalha or to the south etc. you can do this by a one day trip by car. The apartment is cleaned once a week. Fresh towels twice a week and fresh bedding once a week. If desired traditional Portuguese meals can be cooked in the evenings. This is a excellent place to stay. Check in was easy by wonderful friendly people who made you feel right at home. They have a shop near by that was easy to pop in with questions. The establishment we stayed at was directly across from national palace so beautiful view and great location. Perfect place for a tourist location if you want to get out and do things. Beautiful town to stay in. We stayed a week and still could of been longer. Very busy village so if lots of people bother you then don't stay here. This was perfect for us. We loved all the activity right outside our door!! Thankyou for the cozy lovely homey place to stay that had everything we needed!! We would love to visit again. Great View and location. Pretty, Large comfortable near everything. Check in was easy, our host was very friendly. The apartment is in the top floor or the most central building in town. Loved the apartment and Sintra. We decided to see Lisbon from Sintra since we are so close to the train. Ideal spot for exploring. The very best for us is, if guests feel well in Casa Christiane! We do everything, which is possible to reach this! Excellent communications with Christiane (owner) via email from the onset. We were met by Mr Erler upon arrival. He is a warm and friendly individual and a pleasure to deal with. The apartment building is a short 15 minute walk from the train station and is directly across from the Sintra palace (the view from the living room balcony). This makes the area bustling and noisy with tourists during the day but a quiet and calm place by evening. There is easy access to the markets in the 'real' town and the attractions of the Palace of Sintra, Pena and the Castle of the Moors. (Go first thing to avoid the tourists! We would book this location again and would recommend it to others. Sintra is an important historical town at the foot of 'Sierra de Sintra'. Because of the small mountainside with its lavish vegetation and as a result of its proximity to the Atlantic, it has a particularly comfortable micra climate. Here in the vivinity of the ancient Royal Palace the nobility moved to their bright country houses to flee from the summer heat in Lisbon.Sintra and Serra togeather are one Botanical Garden with magical Castles and Palaces and a romantic old town. Golf: Sintra prides itself as the place for golf holiday makers. The 8 courses are quick and easily reached from here. In addition to this there is an area south of Lisbon (1 hour away by car), making the total number of golf courses 14! Giving just a few examples and naming the most important golf courses we have: Estoril with 2 courses (18 and 9 holes), 8 km away. Quinta da Beloura with 18 holes, 4 km away. Penha Longa also with 2 courses (18 and 9 holes), 5 km away. Estoril sol 4 km away (9 hole course). Quinta de Marinha, about 15 km away with 18 holes.